Change up your traditional Thanksgiving desserts with this Ginger Pear Bundt Cake. This warmly spiced cake is topped with a cream cheese frosting. Welcome to November! 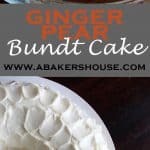 This month’s bundt-baking-get-together, hosted by Baker Street and Cake Duchess has the theme of SPICE. When I came across this recipe for a pear-spice bundt cake by Martha Stewart, I knew I was ready to start baking! The recipe was based on a caramel-pear sauce that was made with fresh pears and sugar then it was incorporated into the cake batter. I was one step ahead of the game as I had a homemade ginger pear sauce. I changed the spices slightly but basically stuck with the cake recipe and then finished with a cream cheese icing. The cake was dense but in a good way, filled with bits of pear and hints of ginger then cooled with the cream cheese frosting. This would be perfect to serve on a Thanksgiving dessert buffet as an alternative to the traditional pies. You’ll find it will be requested for years to come! A beautiful, seasonal Bundt cake for the autumn through Thanksgiving and Christmas topped with a cream cheese frosting. Preheat oven to 350 degrees F. Prepare Bundt pan with cooking spray and a dusting of flour (or very fine bread crumbs). Combine flour, baking powder, salt, ginger, baking soda, and nutmeg with a whisk in a bowl. Set the bowl aside. With an electric mixer, beat the butter, brown sugar and honey for a few minutes then add the eggs one at a time. Now on low speed, alternate adding the flour and the milk to the batter. Once it is mixed well, turn off the mixer and fold in the pear sauce. The batter will be thick. Spoon it into your prepared Bundt pan. Cook for 35-40 minutes, covering the top with foil around 25-30 minutes if it appears to brown too much. Let the cake cool on a wire rack for 10 minutes before turning it out onto a plate. Let it cool completely before adding the optional (but really tasty) icing. Using an electric mixer, combine the ingredients, starting by whipping the cream cheese on its own for a few minutes. Next add the confectioners’ sugar, vanilla extract and cream (or milk). If the icing is too thick then add more milk one Tablespoon at a time. Recipe adapted from this Martha Stewart recipe. If you don't have or want to make the pear sauce, use apple sauce for a similar result. You won’t want to miss these beautiful Bundt cakes contributed by the rest of the Bundt-A-Month group. Join us and link up your own! Love your icing technique! So attractive! Thank you, Dorothy, I appreciate your comment. This might be the easiest icing technique I’ve come across. It hides imperfections in the icing because it doesn’t have to be super-smooth to look great. Yes, this is a great time of year for pears! I just bought more yesterday and will enjoy them while I can! I totally love the aroma of ginger-pear. I actually bought candles with that scent from Pier 1 for years. I can only imagine how yummy this cake must smell and taste. I have to bake it soon. Thanks for your comment, Renee, and for your tweet too! Yes, this cake smelled as good as it tasted. I think “Spice” was a great theme for November. Such a pretty cake. I know if it is Martha’s recipe and has your endorsement, it must be good. Thanks, Karen, yes this recipe was great and I was so happy to be able to use some pear jam that I had preserved. I’m making a new batch next week with plans to share it with you! Thanks for stopping by, Pamela! 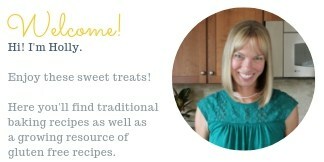 Join us some month soon in baking Bundt cakes! Your cake sounds fabulous Holly and on top of that looks so pretty; love how you decorated this cake! Thanks, Barb! 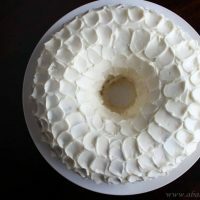 I know most Bundts stand on their own without icing but I just couldn’t resist with this cream cheese frosting. It was tasty. Thanks, Alice, it might not compare to the gorgeous bundt you made this month but I was happy with the results. : ) Thanks for pinning! Thanks, Paula! I was happy with how this bundt turned out. The ginger especially made it perfect for the season. Thanks for stopping by! WOW! I was immediately awestruck by the beauty of your cake. That icing is simply gorgeous. I love pear and ginger together already so this will be a must make for me. Lovely! thanks, Kate! I’d love to hear how your cake turns out if you get around to making this one. I know I’ll make it once or twice more this fall season. 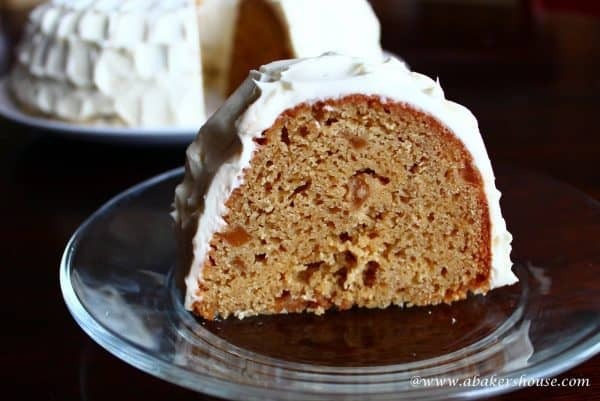 This bundt cake sounds absolutely delicious! I love the icing technique you used; it’s gorgeous. Thanks, Jennie, I played around with the icing a bit after I wasn’t happy with the texture I originally had, it wasn’t smooth enough. I decided to go with it and tried to make a design just by dragging the spatula in small spaces around the cake. I had seen it on Pinterest before and wanted to give it a try. Thanks again for hosting this month. 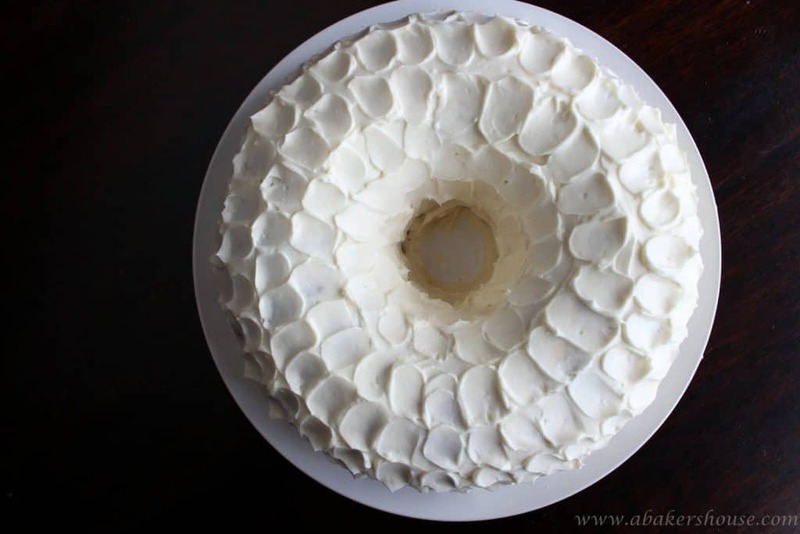 I really enjoyed baking this bundt and am already thinking of ideas for next month. Thanks for bringing so many of us together; I’ve enjoyed reading all of the bundt posts today! I love the way you smoothed on the cream cheese frosting! It looks like a ginger pear igloo. 🙂 Chilly on the outside but warm and delicious on the inside. Yum! Oh Holly! I wish we were neighbors. Your bundt looks exquisite! LOVE the frosting the flavors and how you plated it – just beautiful! What a gorgeous cake! I absolutely love how it’s frosting, and those flavors sound amazing. Can’t go wrong with ginger and pears! What a gorgeous bundt! Your icing looks phenomenal and it sounds delicious! This is gorgeous. I love ginger with pear. Your frosting just takes my breath away. So beautiful. This looks like a fantastic cake! Love that frosting, too! thanks, Lea Ann, I would love to share the next time I make a big cake like this. I shared half of this cake with a friend who had family coming to dinner and easily ate the other half myself!! I really appreciate that you included my cake– your site is beautiful. Glad I’ve found it now! That is seriously gorgeous icing on that cake! Delicious! Thanks, Laura, the icing was a lot easier than it looks– just pull a bit of icing with a small spatula all the way around the cake in small strokes. thanks for stopping by!